The Beretta PMX submachine gun is the newest creation of the famous Italian gun-making company Beretta. First introduced in 2017, it is intended to replace obsolete Beretta PM12S submachine guns in use by Italian law enforcement, special forces and for worldwide distribution. 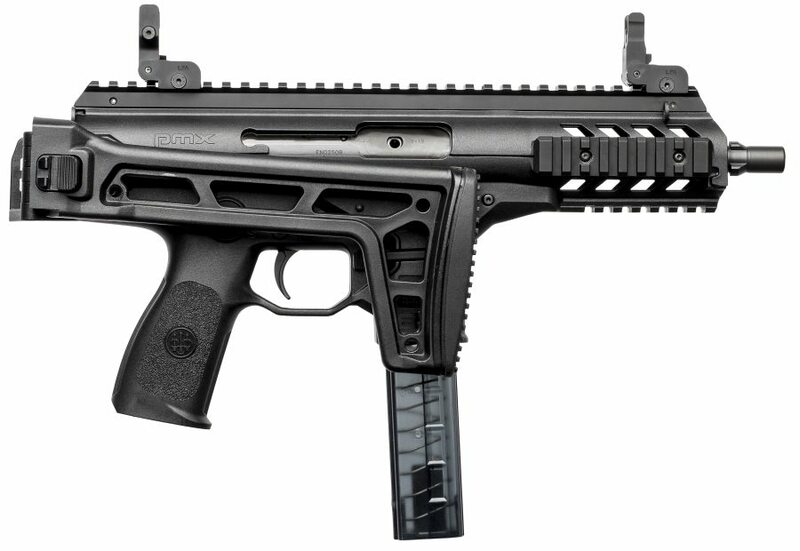 The Beretta PMX submachine gun is simple blowback operated, firing from a closed bolt. It can fire in semi or full automatic. A three position safety / fire selector is located above the pistol grip on either side of the gun. The bolt cocking handle can be installed on either side also. According to Beretta, the barrel and bolt are machined from “..special high strength steel..”. Upper receiver is made from aluminum tube and is covered by a polymer shell. The lower receiver with pistol grip and magazine housing is made from plastic (polymer). This weapon is equipped with integral Picatinny rails and a side-folding, button operated shoulder stock. Ammunition is fed from translucent plastic magazines with 30 round capacity.